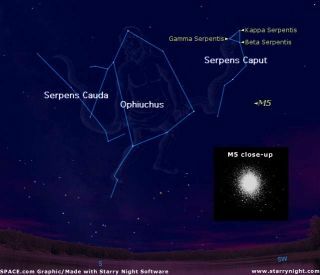 SKY MAP: Serpens as of 9:30 p.m. on Aug. 12 from mid-northern latitudes. Inset shows the globular star cluster M5. The sightof a relatively bright star suddenly vanishing as a faint asteroid crosses infront of it, and then just as suddenly reappearing several seconds later is anexceedingly rare and startling celestial occurrence. But it's happening in thepredawn hours on Tuesday and lucky skywatchers across parts of Canada and thewestern United States may have a chance to see it. Astronomersrefer to such an event as an "occultation" — a temporary hiding ofone celestial object by another such as a planet moving in front of a star asseen from Earth. In this particular case, however, the occulting body will be aminor planet: a tinyasteroid known as 824 Anastasia. ? Thestar in question is Zeta Ophiuchi, the third brightest star in the constellation ofOphiuchus, the Serpent Holder. At magnitude +2.6,it's a star that's bright enough to easily see with the naked eye; you don'teven need binoculars, although they would give a better view. ? Theprojected path of this stellar eclipse — just 25 miles wide — will run fromSouthern California (encompassing a part of the Los Angeles metro area) thengoes north-northeast through central Nevada, west-central Idaho, northwestMontana and on up into Alberta, Canada, passing almost directly over thisprovince's two largest cities, Calgary and Edmonton. TheInternational Occultation Timing Association (IOTA) is encouraging as manypeople as possible to try to see and time the event. "Anyonewho can see and count, lives in or near the eclipse path, and is willing to getup in the middle of the night and go outside for about ten minutes, can help usmeasure the size and shape of this asteroid," said IOTA member BradTimerson. "We want as many as possible to try to observe the eclipse sincethe detail of Anastasia's shape that we can derive is proportional to thenumber of places from which the eclipse is observed." Whatmakes this event so special is that this is the brightest asteroid occultation(eclipse) ever predicted for North America involving an asteroid this large. Duringa similar asteroid-star occultation event that was visible from China in 1991,3,000 skywatchers attempted to see the eclipse. But only four observersactually saw it, since the predictions regarding the eclipse track were somewhatuncertain. Today,thanks primarily to the European Space Agency's star-trackingspacecraft Hipparcos, predictions of such eventshave greatly improved. Ifyou are novice to astronomy and think you'll have trouble in locating ZetaOphiuchi, here is a reliable way of identifying it. You can try it during theearly evening hours of Monday, April 5, which will be many hours before theoccultation. ? First,locate the familiar seven stars that make up the Big Dipper (around 11 o'clock,local time, the Dipper will be high in the northern sky, almost directlyoverhead). Thestars in the handle of the Dipper make a curve that is easily translated into asmooth arc. ? Continuethat imaginary arc about the length of the Big Dipper and you will come to thebrilliant yellow-orange star, Arcturus in the constellation Bootes. Then,follow that same arc past Arcturus for about the same distance, and you willcome to Spica, a bright bluish-white star in the constellation of Virgo. Nowline Spica up with a nearby landmark, such as a telephone pole or the top of achimney. ?Make note of the time and exactly where you are standing. ? lookingat Spica and look toward your landmark. Thanks to the rotation of the Earth,Spica will no longer be there, but another star, shining about one-quarter asbright as Spica will be there instead. That'syour target star: Zeta Ophiuchi. Hereis a view of the shadow track of 824 Anastasia as it moves on asouth-to-north path across western North America. The solid parallel linesdefine the "best" estimate of the path, estimated to be 25 mileswide. But there is still some uncertainty which is why an additional set ofdotted lines are placed on either side of the path, suggesting that the starconceivably might appear to briefly wink out just outside of the main eclipseviewing zone. Between3:34 and 3:35 a.m. Pacific Daylight Time, the 25-mile-wide path is expected topass over Orange County and extend north from there, over West Covina andOntario, Calif.
However,as already has been noted, the location of the path is quite uncertain. Here isa close-up of the track as it passes over southern California. The lightgreen line is the predicted central line, the blue lines are the eastern andwestern edges of the predicted path, the red and gray lines are the edges oftwo zones of uncertainty. ? As itstands, the path could instead pass over downtown Los Angeles or the SanFernando Valley (with a small chance that it could pass over even Ventura andBakersfield), or it could shift east, possibly passing over San Bernardino or,rather less likely, over San Diego and Palm Springs. "Evenan observer on the predicted central line has only a 26% chance to have anoccultation," Timerson said. Afterleaving the vicinity of Los Angeles, the shadow of the asteroid will take fiveminutes to race through Nevada, Idaho and Montana, crossing into Alberta,Canada just before 4:40 a.m. Mountain Daylight Time. Between 4:40 and 4:41a.m., the shadow will sweep over Calgary and Edmonton, but it might pass eastor west of those cities. Oneof the best methods for timing this event is to use a tape recorder inconjunction with a the time signal ticks from shortwave radio station WWV,which can be best heard at frequencies of 5.0 or 10.0 megahertz. Here'swhat to do: With the tape recorder continuously running and WWV on the radio inthe background, call out "D" when the star disappears and"R" when it reappears (or, thinking it like a light, "off"and "on"). ? Ifyou did watch at the right time, IOTA wants to know whether or not you saw anoccultation. "Ifyou had no eclipse of the star, just let us know that fact and send yourlocation in an e-mail message to reports@asteroidoccultation.com," wrote IOTA President David Dunham. "We preferthat you use a GPS receiver or Google Earth, to determine your longitude,latitude, and elevation above sea level." Anyonehaving trouble can send the address of their observation point, includingapproximate distance from the center of the nearest road, and from the nearestcross street. The time an observer starts and stops observing the star ZetaOphiuchi is also valuable, Dunham added.